The Revelation Of, I Wish You Enough To Meet You Soon! 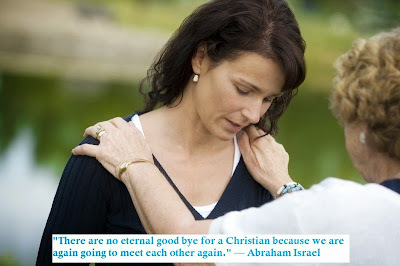 A mother and daughter in their last moments together was overheard by another believer who was standing near by. They had announced her plane's departure and she was standing near the door, she said to her daughter, "I love you, I wish you enough and hope to meet you soon enough." She said, "Mom, our life together has been more than enough. Your love is all I ever needed as you have showed me what it means when God Himself compared his Love to be like that of a mother (Isa 66:13). I wish you enough to meet you soon, Mom." Then they kissed good-bye and she left. She walked over toward the window where this man was seated. Standing there He could see she wanted and needed to cry. He tried not to intrude on her privacy, but she welcomed him by asking, "Did you ever say good-bye to someone knowing it would not be forever because of Jesus?" Yes, I have," he replied. Saying that brought back memories he had of expressing his love and appreciation for all his Mom had done for him and how she taught him to trust God by faith. Recognizing that her days were limited on earth, he took the time to tell her face to face how much she meant to him and no matter what how Jesus has given them a hope for a reunion again because He said, "I am the resurrection and the life. They who believes in Me, though they may die, they shall live." (John 11:23, Paraphrased). So he knew what this woman was experiencing. "Forgive me for asking, but why is this not a forever good-bye?" he asked. "I am old and she lives much too far away. I have challenges ahead and the reality is, her next trip back will be for my funeral, " she said. "When you were saying good-bye I heard you say, 'I wish you enough to meet you soon.' May I ask what that means?" She began to smile. "That's a wish that has been handed down from other generations by faith. My parents used to say it to everyone who believed Jesus." She paused for a moment and looking up as if trying to remember it in detail, she smiled even more. "When we said 'I wish you enough to meet you soon,' we were wanting the other person to have a eternal abundant life filled with enough good things to sustain them on earth and for eternity," she continued and then turning toward this believer she shared the following as if she were reciting it from memory. I wish enough "Hello's" to get you through the final "Good-bye to meet you soon as there are no eternal Good-bye for a Christian." As this believer man realized the hope they both had in their own life of a life beyond this world in Jesus, both of them began to rejoice God and praise Him for the eternal promises of more than enough which He had given to them to meet each other soon (John 10:10). Then when they were about to part ways after the journey, the man said to the old woman, 'Mama, I wish you enough to meet you soon,' and she wished the same blessing over him. With tears of joy they reminisced the experience of the God encounter of their journey to rejoice daily to have their hope strengthened in God. Death is not an end of life, but is the beginning of a never ending life with God and all our loved ones who have believed in God and have appropriated the gift of eternal life that He has given in Christ Jesus. "Rejoice in the Lord always. Again I will say, rejoice!" (Php 4:4).